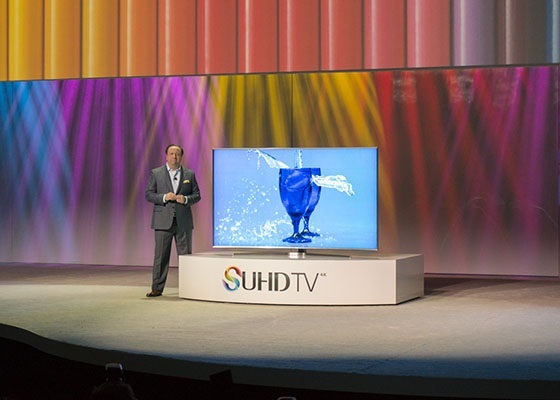 Samsung has hit one straight out of the ballpark yet again at CES 2015 signaling that 4K is officially here to stay. During their keynote Presentation on Tuesday January 6th 2015 at the biggest Electronics Convention in Las Vegas, Nevada that was attended by President and CEO of Samsung Electronics, BK Yoon, Samsung basically told the Television Industry that Change is Possible while heralding the Internet of Things. Samsung has turned it up a notch with the revelation of a completely new Technology called SUHD that uses Quantum Dots for their JS8500 Series of Smart UHDTV’s, fulfilling a promise that Head of Samsung Electronics’ TV business, Kim Hyun-seok, had reiterated in November 2014 to abandon QLED for these brighter more energy-efficient technology . Not only that, but they’ve also introduce Tizen as the Operating System that’s running their line of SUHD in 2015, with older 1080p models being left out of the update cycle. This is a direct introducing of the Tizen OS their consumers in much the same way they introduced in the Samsung Galaxy Gear smartwacth as noted in Samsung’s Galaxy Gear S Smartwatch coming to Jamaica while reppin’ for Tizen. So folks, 4K is no gimmick, especially now that they’ve entered into a UHD alliance with Panasonic and other Streaming and Hollywood Content Providers to definitively create Standard as to what constitutes a UHDTV (Ultra High Definition Television). Samsung, it seems, is setting themselves up to roll out Tizen OS smartphones to pair with your UHDTV. More on that in a future article on Tizen OS smartphones when they launch. They’re shaking off 2014, Taylor swift Style, and their disappointing attempts to launch Tizen OS based Samsung Z smartphones in Russian as noted in Samsung Z running Tizen OS fails to enter Russian Market hints at Caribbean and Latin American Launch. Samsung is pressing ahead full steam with their introduction via Television sets and possibly other appliances connected to the Internet as part of the trend towards the Internet of Things. Right now curved UHDTV wasn’t enough for them, a product that’s now available here in Jamaica as noted in Samsung unveils their First Curved Ultra High Definition TV, the U9000 Series at Mona Visitors Lodge. 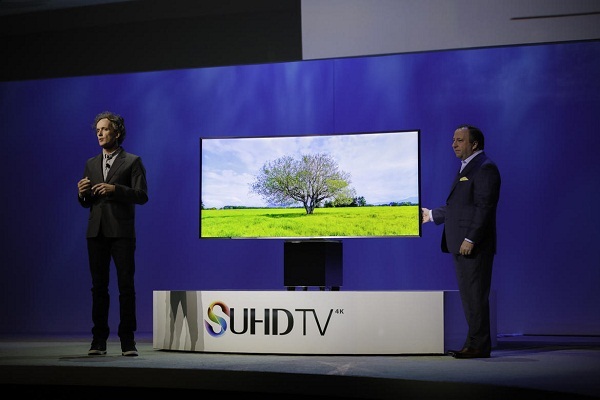 SUHD is now the in thing for Television this 2015, the Year of the Sheep! So how does Quantum Dot differ from traditional LED backlit LCD TV’s? Best way to put it; sometimes when you stand apart from the crowd in your own little group, your voice will be heard loud and clear! Instead of OLED (Organic Light Emitting Diode Transistors), this technology uses nanoscopic groupings of crystal molecules, usually 20 to 100 molecules, hence the name Quantum Dots. These Quantum Dots produce light when their electrons in their outer shells are stimulated by radiation which results in change in energy levels. When the electrons fall back to their ground state energy level, they produce wavelengths of light depending on the energy level they fell from back to ground state. It’s easier to stimulate Quantum Dots, as in such small groupings of atoms, they are freed from the Covalent, metallic and Van Der Waals Forces of electrostatic attraction that create the macro-molecular versions of the elements that we are used to interacting. Instead, they are now able to shine, and depending on the size i.e. number of atoms in a Quantum Dot and type of quantum crystal, they produce different colours when minute electrical stimulation is applied. As with all television sets, Samsung SUHD uses LED for backlight to illuminate a grid of LCD (Liquid Crystal Diodes) that produce the images you see. It’s just that they’d made with Quantum Dots instead of the traditional manufacturing method typical of normal LED for backlighting. This results in a TV that uses far less power than LED and in the process producing a brighter image. Consequently, it can be smaller, as there is less waste heat to dissipate, a problem which actually gets easier the bigger the TV screen. For the JS8500 Series of Smart UHDTV’s, that translates images up to 2.5 times brighter than traditional OLED TV’s with better rendering of Black and darker colours. Like the curved u9000 UHDTV Smart TV’s, the JS8500 Series also uses the One Connect Mini box that runs on Tizen OS instead. When these series of UHDTV go on sale in March 2015, buyers will get 4K Streaming content from Comcast, DirecTV, M-Go, Netflix and Amazon assuming they have prior subscription to these services. HEVC decoding and HDMI 2.0/HDCP 2.2 connectivity is a must for these types of TV but I’d be interested to see how these TV’s perform when playing 4K Video Games as mentioned in Samsung unveils their First Curved Ultra High Definition TV, the U9000 Series at Mona Visitors Lodge. Still, the Change is Possible. I like the change that the JS8500 Series heralds and the possibility that Tizen Holds. Just goes to show that sometimes to shine, you have to be like a Quantum Dot and stand apart from the crowd.